Unique Needs. Custom Products. 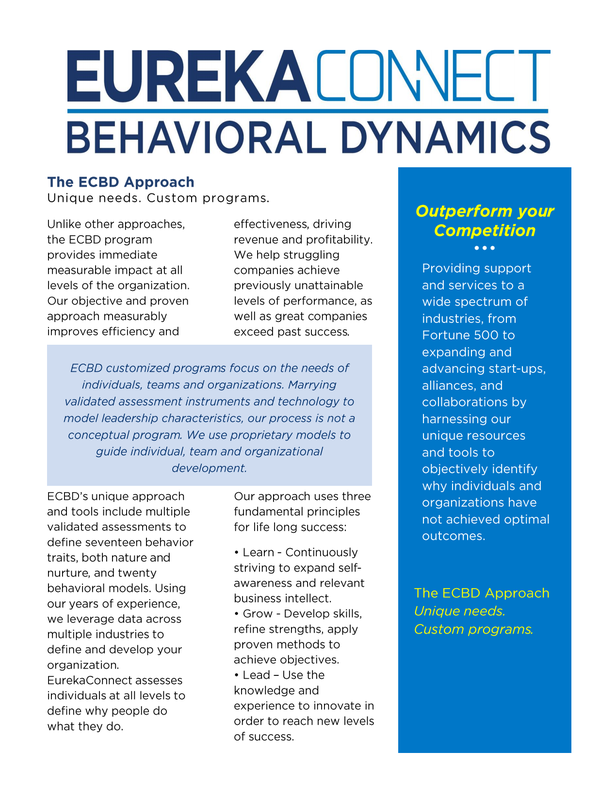 ECBD customized programs focus on the needs of individuals, teams and organizations. Providing support and services to a wide spectrum of industries, from Fortune 500 to expanding and advancing start-ups, alliances, and collaborations by harnessing our unique resources and tools to objectively identify why individuals and organizations have not achieved optimal outcomes. ECBD customized programs focus on the needs of individuals, teams and organizations. Marrying validated assessment instruments and technology to model leadership characteristics, our process is not a conceptual program. We use proprietary models to guide individual, team and organizational development. Individual Development Plan – Individuals take a thirty-minute on-line assessment. EurekaConnect uses the results from the assessment to create a written IDP that analyzes seventeen behaviors in twenty behavioral models. The IDP provides customized personal recommendations on how to improve personal performance and leadership skills. A behavioral specialist conducts a personal review. Personal Objective Plan – This condensed report helps individuals understand how their models impact outcomes. The POP is discussed during a fifteen-minute feedback session with a EurekaConnect behavioral specialist. Participants will develop a deep understanding of how to focus development and how one or two behaviors can disrupt one’s ability to contribute constantly in a positive way. Team Development Plan –This team report identifies cultural and team dynamics that can be leveraged or are detrimental to team performance. The report uses the same twenty Behavioral Models used in the IDP to provide a team with analysis and recommendations that are used to guide team development and training. On-site training – These are custom half day or full day sessions that utilize the TDP to focus development. 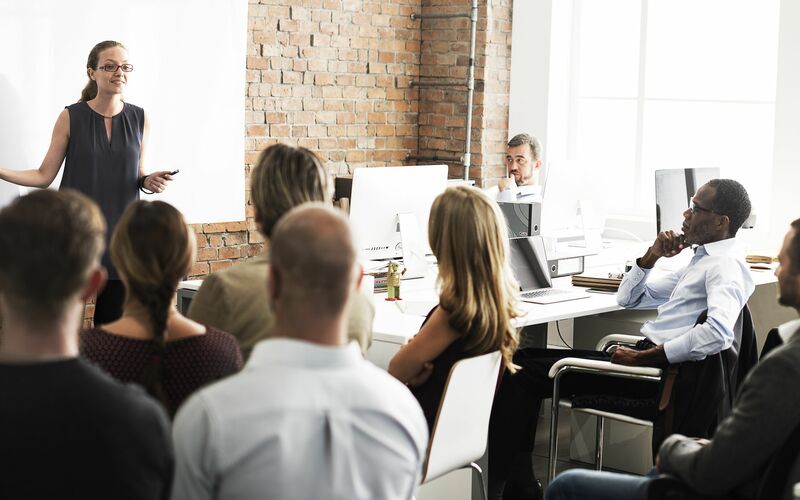 These interactive sessions engage participants in a series of exercises that help them to better understand leadership concepts and the importance of personal development. Webinars – These are customized online web session focused on specific development objectives. EurekaConnect currently has sessions covering Stress, Conflict Resolution, and Listening and Communication. Mentor Accountability Program – After going through a POP report that helps program participants focus development, EurekaConnect will pair team members who will be responsible for supporting their colleague’s development. The program forms strong partnerships and accountability. The student becomes the teacher in the process of learning. This is a powerful program that leverages the ECBD data, reports and training in the context of real world work environments. Candidate assessments – Using IDP results, EurekaConnect reviews these profiles with corporate leadership to help them understand the potential of a candidate given a specific job requirement. 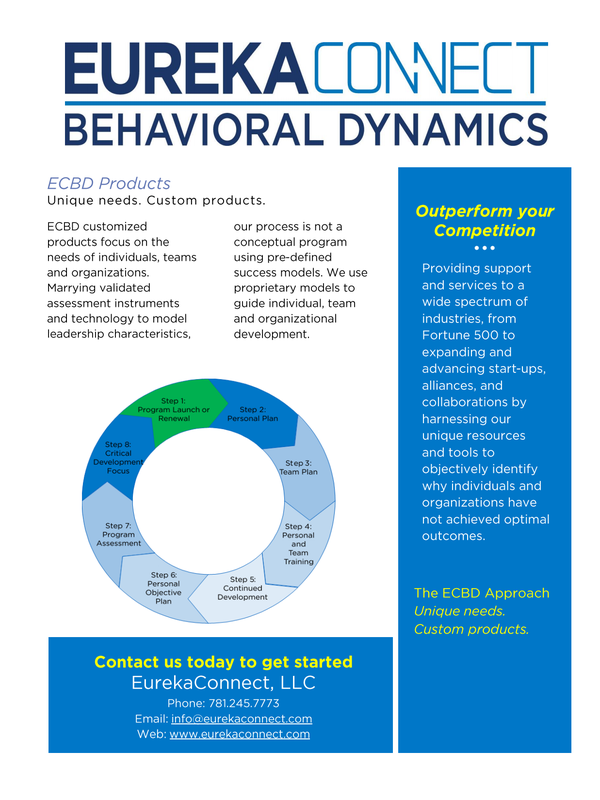 ECBD 360 – The ECBD 360 process objectively identifies areas for improvement by linking the “why” people do what they do to “how” others perceive their actions. The process uses the standard IDP profile with an overlay of data from a selected group of colleagues, family and or friends. The report allows participants to focus on a personal and professional development plan, with measurable goals and objectives.